Estimates suggest that heating and cooling your home accounts for 40-50% of your home’s energy consumption. This means that homeowners are always looking for ways to save money on the cost of heating and cooling their homes. Recently there has been a lot of discussion about WiFi thermostats and the ways they can save homeowners money. In particular, there has been a lot of hype surrounding Ecobee’s WiFi thermostats. However, you may be wondering how these thermostats can save you more money than a traditional programmable thermostat. Not only do WiFi thermostats provide greater control over your system by allowing you to control your thermostat remotely via your cell phone, but also, Ecobee thermostats provide additional features that give you greater control over your HVAC system, helping you to maximize comfort and energy-efficiency. Here are just a few of the benefits an Ecobee thermostat can provide you with. One of Ecobee’s more popular features is the sensors you can connect to them designed to help you maintain an even temperature in your home. The problem with standard thermostats is that they adjust temperatures based on the temperature in one room, which can create hot and cold pockets throughout your home. Alternatively, Ecobee allows you to place sensors throughout your home (you can connect multiple) that constantly monitor the temperatures in different rooms throughout your home. Ecobee then uses the data from these sensors to adjust the temperatures. Speaking of energy consumption, Ecobee’s Home IQ feature provides you with a detailed report of your system’s energy consumption each month, showing you where your Ecobee has helped to save you money, how frequently your system ran that month, and how your current energy consumption compared to previous months. This can help you to closely monitor exactly how much money you are spending heating and cooling your home, and it can help you decide how you may want to adjust your settings in order to further save money on your energy bills each month. Home IQ provides you with the knowledge you need to have the greatest control over your HVAC system. 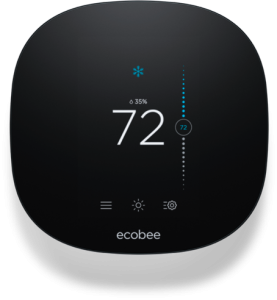 Another great thing about the Ecobee thermostat is that it is compatible with almost all residential heating and cooling systems, meaning that it will likely work with your home’s current HVAC system. However, before you go out and purchase an Ecobee thermostat, you should check to make sure that your system is compatible using the compatibility checker on their website. Ecobee is also compatible with a variety of smart home devices including Amazon Echo, meaning that you can control your thermostat simply by asking Alexa to change the temperature. In fact, Ecobee represents the next step in the fully automated smart home, as it comes with Amazon Alexa voice service built inside. This means that not only can your thermostat pair with your Echo, but it can also serve many of the same functions as an Amazon Echo if you do not have one. Ecobee will also integrate with Sonos sound system! Ecobee then provides complete hands-free control, as all you have to do is ask and Ecobee will not only change the temperature, but it can also set timers, set the music, and help you find the perfect recipe. With its embedded microphones with far-field voice recognition and a speaker engineered for clear voice, you won’t have to be next to your thermostat in order to use it to interact with Alexa. One of the main reasons that smart home thermostats are growing in popularity is due to the fact that they provide users with the ability to control their home’s HVAC system on the go using their Android or iOS device. Using the Ecobee mobile app you can set your home’s temperature remotely, which can allow you to ensure that your home is comfortable when you return home from work. Being able to control your HVAC system remotely will give you ultimate control, which will allow you to ensure your comfort at all times while maximizing your energy savings. Proper maintenance of your HVAC system, and having it serviced and repaired when necessary, can help to ensure the longevity of your system and prevent an unexpected breakdown. However, how will you know when your system needs professional attention? Fortunately, with a WiFi thermostat, this is no longer a concern. With an Ecobee thermostat, homeowners can set up alerts so that their thermostat will warn them if their system is not working properly and needs to be serviced. Additionally, homeowners also have the option to create reminders for annual system maintenance, filter changes, and much more. Not only can an Ecobee thermostat transform the way you interact with your home, but it can also add an upscale modern look to your home. While many homeowners do not regularly consider how their thermostat looks, an old thermostat can give your home an outdated feel. This is particularly true if you still have an old-fashioned manual thermostat in your home. Upgrading to a sleek and modern thermostat with a touch screen and bright display will help you to create a modern feel in your home. By having an Ecobee WiFi thermostat installed in your home you will have greater control over your HVAC system, helping you to ensure the comfort of you and your family while also reducing your energy consumption. Contact us to learn more about WiFi thermostats and the ways in which they can revolutionize your home’s HVAC system!